Many people are searching for the same Munchee information! Below are some of the questions parents and practitioners frequently ask us about the Myo Munchee and it's use. Try looking here first and if your question is not answered below please get in touch via the Contact Us page. Q. Which Myo is right for me? 6-8 years: Use small Myo Munchee. About the Handles: Children in this age group will use the appliance actively. The handle is useful to ensure we get the appliance into the correct position in the child’s mouth. Once the older child is accustomed to it you can cut the handle off. The handle can also be helpful for those children with poor oral motor control and who have difficulty keeping the appliance in place in the mouth. e.g dribblers and mouth breathers as well as children with special needs. 9-12 years: There can be a variety of structural sizing in children of this age group. A small 9-10 year with a narrow bite would be best starting with a small appliance and then moving up to the medium once they are used to it. Once the child has their 12 year old molars in place they have an adult bite so the medium appliances are the best option for them. For children with special needs these medium appliances can be produced with a handle for better dexterity. Children over 13 years will be included in the adult section as once they have their 12 year old molars in place they have an adult bite. Teenage girls/Women and teenage boys will use the Medium appliances. Adult males and larger structured teenage boys will use the large appliances. Some larger structured women also enjoy using the Large Myo Munchee for extra jaw exercise. Q. How do I fit a Myo Munchee? This short video explains and demonstrates how to fit a Myo Munchee. The dental nurse doing the fitting should know as she literally helped hundreds of children when she worked with Dr Kevin Bourke before his retirement. For more details behind that story see the other videos in Real People. Q. How often do I need to use a Myo Munchee? At minimum, for general oral health and keeping muscles strong the Myo Munchee works if your child can chew for 4 mins once a day. For 18 month to 5 year olds change should be evident in about 4 weeks and chewing should continue for 6-12 months minimum. For older children 6-12 years old in conjunction with dental and other therapies the recommended usage pattern is 10-20mins per day active chewing, 60 mins passive use (watching TV, reading etc) plus overnight use. Changes should be evident in 8 weeks and should continue for 12-18 months. This depends on a few factors, but as a general rule a Myo Munchee should last between 12 - 18 months with regular use. As the bite improves so too will the durability of the Myo Munchee, this is because the forces working across the device will be lessened by improved teeth position. Those who are heavy chewers, teeth grinders or wear the appliance more frequently than recommended may experience a shorter lifespan. Good care of the appliance is very important and it should be washed after every use and sprinkled with bi-carb soda weekly. If with regular use, your Myo Munchee breaks in the first 8 weeks we will replace the device free of charge. Q. What are these products made of? How do I know they are safe for my child/self? The Myo Munchee is made from medical grade silicone, a safe and approved material. For the technically minded, we have a comprehensive report on the bio-compatibility of these materials, just click here to download. Your Myo Munchee should be washed after use and sprinkled with bi-carb soda then rinsed weekly to maximise lifespan. Q. Can the Myo Munchee be used after orthodontic work? The Myo Munchee can be a very useful adjunct following orthodontic work. However, you need to check with your treating orthodontist or dentist if the Myo is appropriate for you post treatment as there are many and varied approaches to orthodontic care. Myo Munchee acts on the facial muscles and helps them stay oxygenated and strong and helps keep teeth and gums clean. Both these factors can really help support the long-term outcome of orthodontic work. Feel free to have your practitioner contact us if they require further information on benefits and use. Q. What is “ACTIVE USE” of the Myo? Simply insert the Myo correctly with the “v” shaped notch at the front top. Move the jaws so that the top and bottom teeth sit comfortably in the Myo. Bring the lips together - this is critical to success. Simply “munch” up and down gently on the Myo. 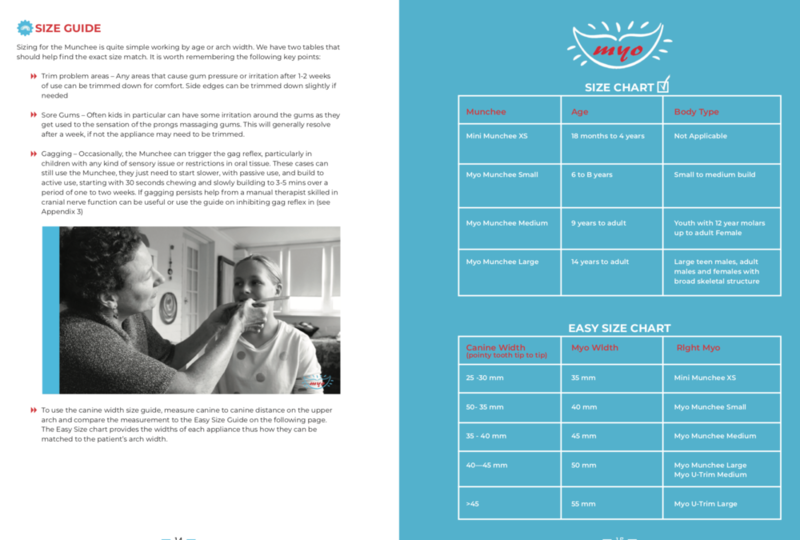 As your gums strengthen there may be some discomfort, but if your Myo Munchee is too large, it's simple to trim to size. Q. What is the difference between a Myo Munchee and a Myobrace? The Myo Munchee is in fact a distant relative of the Myobrace. The Myobrace and the system that accompanies it are excellent early interceptive orthodontics prescribed and supervised by dentists as a full treatment protocol and plan. Myo Munchee is not intended or sold to the general public as an orthodontic appliance, rather to promote active use of the jaws and the muscles that move them. Over time, we have seen the use of the muscles in this way promote nose breathing, encourage natural bone growth and therefore arch expansion. This is due largely to the development of muscles and improved lip and tongue position from the use of the Myo Munchee. The improved function of these muscles and tongue, (soft tissue) can result in changes and growth within the bony structures, which allows for an improved position for the teeth and jaws. The key difference is that Myo Munchee is chewed actively, while the Myobrace is passive and uses exercises to help with muscle tone. Some dentists utilise both systems as the Myo Munchee can act as an early interceptive orthodontic appliance, particularly in the 2-5 year old age group. Q. Is there any research on the Myo Munchee? Dr Kevin Bourke did a number of studies at Osaka University in Japan (where some of the Myo Munchees are made). With compliant use, the Myo was shown to have some very positive effects on cases of plaque and open bite (teeth not fitting at the front). You can read Dr Bourke's summary here. Myo Australia is actively seeking research partners and opportunities to further the work started by Kevin and his team. In recent years there has been a great deal of research done on chewing, breathing and lip and tongue position, see our Science Corner to find out more on this exciting and emerging area. Q. Will using the Myo make my bone grow back? No. Lost Alveolar bone will not grow back, but active exercise with the Myo will prevent further Alveolar bone loss and ensure retention of the teeth. However, "Wolf's Law” has determined the greater loading through the bone, the stronger and more dense it becomes. Q. Will the Myo stop snoring? Firstly, it is important to understand that snoring and disorders of breathing during sleep are very complex and multifactorial conditions. The Myo Munchee can both as part of a management plan where appropriate. The main role of the appliance is to assist in muscle relaxation, strength, lower jaw positioning and nasal breathing, all critical factors in these conditions. One of the key roles of the Myo Munchee is to help bring a small bone in the neck called the "hyoid bone" upwards, this may not seem like much but many muscles controlling and effecting the tongue join to this bone. In promoting improved position of both the hyoid and the tongue coupled with nasal breathing, is how we believe the Myo appliances assist reduce snoring. Q. Can I use a Myo appliance instead of my dental splint made for me by my dentist? This is something you will need to discuss solely with the treating dentist as splints and various appliances are used for a variety of reasons. We're more than happy to answer questions or provide more details to your practitioner if required. They may also like to read our practitioner information page. Rather than think of it as a "this or that" try to look at the benefits of the Myo Munchee such as muscle tone, oxygenation and gum health to see if it is a good fit with your treatment. We have a practitioner only model, the U-Trim, your treating practitioner is welcome to contact us for more information. Q. Which appliance is best for TMJ and headaches? These kind of conditions can be tricky as they can have multiple causes and require multiple treatments to resolve. The Myo Munchee can be an excellent tool to assist provided you refrain from vigorous active use as the muscular activation and sensory stimulation can help correct muscle balance and function. We recommend passive use with an appropriate Myo Munchee in conjunction with your current treatments and practitioners. Q. I am an adult female and have a small mouth- which appliance is the best option for me? Try a Myo Munchee appliance in medium size. When choosing size bear in mind it is better to have the appliance slightly larger rather than tightly fitted.